Australia’s first multi-screen viewing report, released today by Nielsen, OzTAM and Regional TAM, shows that new sources of video content are adding to, rather than cannibalising, traditional TV which continues to rise in use. The ‘Australian Multi-Screen Report’ found that PVRs, internet-delivered video, tablets and smartphones are creating additional opportunities to view video content, but compared to traditional TV the access of video content through other devices remains low. Head of Nielsen’s media industry practice in Australia, Matt Bruce, says the findings provide much-anticipated insights into the way media is consumed, thereby helping to understand viewing habits and more successfully reach and engage with audiences across multiple screens. “The introduction of DTT [digital terrestrial television] and time-shifted viewing, and the speed with which Australians are adopting new technology which delivers broadcast content anywhere, anytime has impacted the way in which traditional television content is accessed,” Bruce says. The average monthly time spent viewing television broadcast content in the home via conventional TV sets increased by 6.1% between quarter four 2010 and quarter four 2011 to 113 hours and 38 minutes. Combined, time spent consuming video content via PC and mobile device accounted for just 4% of this, with three hours 27 minutes spent on PCs and one hour 20 minutes spent on mobile device per month. Average monthly time spent viewing playback (recorded) television content increased by four hours and 31 minutes (60%) since quarter four 2010, to equal 12 hours per month in quarter four 2011. According to the study, 95% of all homes have at least one DTT-enabled TV set and 44% of households have access to time-shifting devices, such as PVRs. 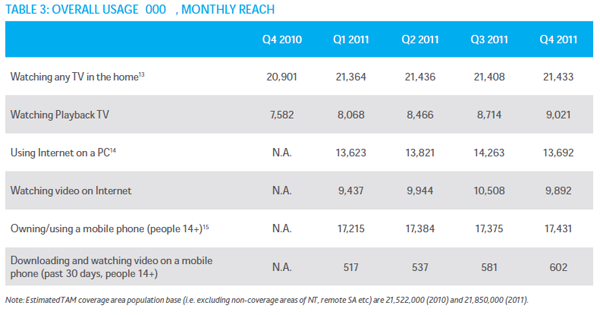 Penetration at these levels puts playback TV reach at nine million Australians, while 9.9 million watch video on the internet and 0.6 million watch on their mobile phone. Growth in access of traditional TV occurred across all age groups in 2011, apart from people aged 25-34 years. People aged 18-24 years exhibited the largest increase during the course of year. Online video consumption also increased across all age demographics during 2011. People aged 18-34 years displayed the highest use of video through PC and mobile phone at five and around three hours a month respectively. The online audience was skewed more towards males in comparison to traditional TV, at 62% male for both PC and mobile, compared to 47% for TV. Video watched on tablet devices, which now inhabit 10% of metro households, was not tracked in the study.